Mecalux has provided Alifrut –a Chilean frozen fruit and vegetable provider– with four blocks of drive-in pallet racking in its frozen storage chamber. The shelves are specially designed and reinforced to absorb all possible forces generated by potential earthquake tremors. The installation successfully survived an 8.3 magnitude earthquake which shook central Chile in September of 2015: no goods fell, nor was it necessary to change or reinforce any material. Alifrut is one of the largest producers and exporters of frozen fruits and vegetables from Chile. The company has four processing plants near the country's major seaports to optimise logistics, maintain the cold chain and streamline merchandise distribution worldwide. The Alifrut plant in Quilicura (Santiago de Chile) mostly focuses on the processing and final packaging of products. Mecalux has equipped one of its frozen chambers with four blocks of drive-in racks. The racks are composed of the highest quality materials and meet the strict anti-seismic regulations in Chile, ensuring optimal performance of structures during earthquakes. Alifrut's drive-in racks consist of four level high lanes, which reach 10.5 m in height. Likewise, the levels have support rails on both sides, made in a triangular shape to facilitate the positioning and support of the pallet. When managing loads, operators, aided by reach trucks enter the lanes with the load raised above the level where it will be placed. There are guide rails on the floor that help the forklift to enter and move inside lanes safely and well-centred, minimising the possibility of accidental damage to the racks. The rack frames are reinforced by braced profiles that give longitudinal rigidity and stability to the structure. Thus, the racks are poised to withstand potential earthquake tremors and to avoid goods from falling. In Chile, a modal spectral analysis is used –the most common and generalised according to anti-earthquake standards– to safeguard structures during an earthquake. It is study oriented towards obtaining the set of horizontal forces (shear stresses) acting on each racking level and what must be absorbed between the racks, rails, braces, unions, etc. Material types (mechanical characteristics and steel quality). Dimensions and mechanical properties of the profiles (uprights, beams, braces, etc.). Load cases (loads due to the structure’s weight, of the housed unit loads, etc.). Delineation of the design spectrum for the earthquake between two orthogonal directions. This spectrum hinges on the dimensions of the structure and the seismic data (the seismic zone where the warehouse is located, soil type, etc.). Load combinations as stated in the NCh 2369 standard. Once the data is entered into the model, structural calculations are carried out which combine all the forces that interact with the structure to ascertain the forces and buckling. Next, it is tested whether these fall within a permissible, safe range and, finally, the racking components are sized out. A particular aspect to bear in mind about the NCh 2369 standard is that it requires all structural elements to be capable of withstanding traction and compression forces. The analysis is performed in two orthogonal directions: parallel to the frames, the effect of the earthquake is supported by the frames themselves; while in the perpendicular direction, frames are underpinned by the horizontal and vertical bracing. 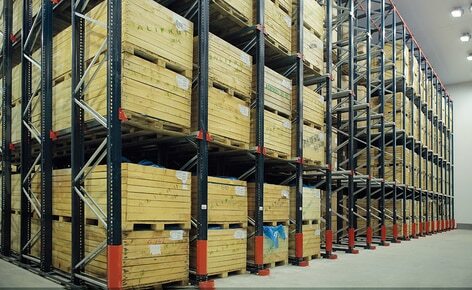 Optimal storage capacity: drive-in pallet racks offer a storage capacity of over 2,900 pallets. Earthquake-resistant: racks are calculated and specifically reinforced to withstand any seismic movement that may occur.